(2) screenplay for the drama is done by the same screenwriter as "I have a date with a vampire"
(3) wardrobe and set is done by the same person who did zhen huan! Hey! I got back home yesterday and am up to date at ep 12. I was ROFL when the thingies came out of the cupboard. Peng Guanying did a great job with his facial expressions and body language without overdoing it. The trailers for next week gets me so excited. Looks like Yuwen Yong is finally showing his jealous side. I haven't read anything myself but I heard that there were two versions of the ending released. The original ending was when Qingsuo died after Lanling Wang left and she realised that the one she loved there and then was actually Yuwen Yong. But then the author revised the ending in a second edition where Qingsuo was saved by Zhou spies sent by Yuwen Yong, and she died in Yuwen Yong's arms after some happy days together. Apparently the author did set out the write the story about Lanling Wang, she grew to like the character she created in Yuwen Yong so revised the ending in the second edition. Whether the title is 蘭陵王妃 or 蘭陵皇妃, it does not matter since it may be referring to a title and not the actually person. My thoughts are that Duanmu Lian/Yuan Qing Suo's main motivation to find the magic pearl and get the magical objects was to finish her family's legacy and then she would be worthy to be the Princess of Lanling. But at the end, she not only did not get what she wanted, she also realised that she no longer really wanted the title anymore as she fell in love with Yuwen Yong. yay!! you are back! I was kinda getting worried that I seemed to be talking to myself on this discussion forum! yes...i understand there's that revised ending version floating around the internet which I much prefer cos there's closure for everyone involved! following on from your revised ending. I hope Yuwen Yong decides to conquer Qi as a means of 'revenge' for Qingshuo. when he meets Lanlingwang, he informs him of how Qingshuo died. Lan Ling Wang commits suicide (by drinking poison wine) after going through the wedding rites with Luo Yun. there had better not be a scene where we see Qingshuo waiting for Lanlingwang in her wedding clothes in the after live! I have been looking at the music videos and there's some interesting scenes i cannot wait for! qingshuo dancing with a mask on and attempting to assassinate someone. yuwen yong DANCING with her. yuwen yong holding on to Qingshuo at the cliff. that bed scene! Qingshuo on the bed stabbed with a knife and Luo Yun looking at her hands. regarding the actors/ actresses...this is the first time i have encountered them. but apparently Peng Guan Ying is characterized as 'Shi li' actor. which show was he in previously to get called that? what about the lead actress? it seems she's been acting for a long time too! here's episode 15 trailer...if you look at the top of the trailer, it states that the show will be airing from Tuesday to Friday at 8pm. so thats back to 4 episodes per week! I'm obsessed with this show. It's not Nirvana in Fire but it is so addicting. I am really loving the relationship progression of YWY and SQ. They are adorable. LLW and SQ has this gorgeous first love story. Everything about this show from the costuming to the cinematography is gorgeous. I don't know why Hunan took forever to release this series. The actors are relatively young and are doing a great job. No one is awkward and the chemistry is flying off the charts for the 3 leads. Too bad no one is subbing it but thank goodness there are Vietnamese subs and voice overs on YouTube. You guys should read the replies to his weibo post...loads of affirmative replies to Yuwen Yong instead of Peng Guan Ying! I just finished ep 13! Looks like Yuwen Yong and Qingsuo are getting more comfortable with touching each other. Yay! 4 eps per week! Woohoo! - Peter Ho looks bad with flowing hair. - The height difference between Peng Guanying and Zhang Hanyun keeps changing in different scenes. Standing of the ground, the top of Zhang Hanyun's head should just reach Peng Guanying's shoulder. But at times, the top of her head reaches his ear for her to rest her head on his shoulder so I guess she must be standing on blocks for those scenes. Last edited by charbydis; 10-19-16 at 04:32 AM. Unfortunately according to history, Lan Ling Wang did not live to see Zhou conquer Qi. He was forced to drink poison by his evil cousin (gosh, everyone seems to have evil cousins in this series) and after he died, then the morale of the Qi armies went downhill. Fueled by the Qi Emperor's attitude, Zhou was able to overwhelm Qi and annihilate the whole kingdom. And then Yuwen Yong died shortly after that, and then Zhou fell as well. I would rather Yuwen Yong meet Qingsuo in the afterlife, but there is a scene of Qingsuo dressed in red waiting for Lan Ling Wang under some red trees. I just want to see the bed scene and the cliff scene. I have known about the three lead for a while, but have never really seen them act until this series. I know that Andy Chen is a Taiwanese singer. I know that he is due to appear in a few ancient series but I have not watched them before. Zhang Hanyun started out as a singer when she was a teenager and then starred in a teen movie financed by Andy Lau, and then there was nothing for a few years. I then saw her again in "Up Idol" reality show where she sees to get on very very well with Zanilia Zhao and I heard that she was out of job for a few years due to problems with her management company. "Princess of Lan Ling King" is her first big break after the hiatus, which is also her first lead role in a series which she also gives out her first ancient onscreen kiss. She also has a part in "Xiao Shiyi Lang" (was filmed after "Princess of LLK", but was broadcasted earlier) which has given her good reviews, but I didn't like the series and didn't get past the first few episodes. Peng Guan Ying I know of because I looked him up after I saw his poster for "Tribes and Empires" sometime earlier this year. 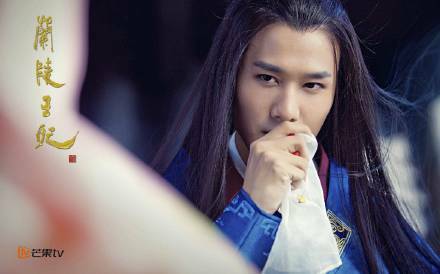 So if you like him as Yuwen Yong, tune to watch him in "Tribes and Empires" in which he has a supporting role, but this is a grand production. He was in "Naked Wedding" but I didn't really watch that series and did not notice him. Anyhow I am glad to have refreshing faces in a large production. I am enjoying the chemistry between them three at this point. For Yong-Suo fans, seems like Peng Guan Ying and Zhang Hanyun have worked together in a modern series before "Princess of Lan Ling King" but did not act as a couple. And initially, Peng Guan Ying was not the first choice to play Yuwen Yong. Jing Bo Ran was the first to be casted but then resigned from the role for some unknown reason. So fellow fans, we were very close to have missed out this wonderful onscreen couple. Last edited by charbydis; 10-19-16 at 08:06 AM. I don't think it was Hunan Mango who warehoused this series, but rather the series took a while to pass China's SARFT Broadcasting Board. The series was filmed in 2013, but if you look at the opening themevideo, the approval was in 2015. I am guessing probably the board didn't like how some of the plot did not mesh with historical facts and the production crew had to chop and edit it in order to get the licence to broadcast. I just hoped they edited it properly so that it makes sense and we do not have another TJOF incident which was very traumatising to the audience. Last edited by charbydis; 10-19-16 at 08:11 AM. Hey! Welcome! Yes it's not nirvana but very addictive! OMG!!!!!!!! That wasn't in the book at all!! Am all for extra lovey dovey scenes between those 2! If trailer 16 is out that means ep 14 is out too!!! Yay!! Do you know what they are talking about in the trailer? I don't understand Chinese. Is there an English translation of the novel or a summary of it? --> i think this scene speaks alot about yuwen yong's intelligence...he knows why the qi general is doing and knows that qingshou will be leaving him soon. qingshuo eats and discovers the pearl. yuwen yong tells her thats the pearl she's been looking for and that she can leave with it and now is the best time to leave. --> not the kind i am looking for but hey at least they are warming up to it! and that conversation basically means yong is declaring himself! i dont know of any english translations of the novel. try googling. alternatively feel free to ask for spoilers but my spoilers are on the internet novel. i understand she did revisions for the tv drama and thats only available in book form. The title actually has a double meaning in where it refers to the Spider Lily (Bi An Hua), which according to legend is the flower of Hell and carries a meaning of death or eternal separation. I can't remember the specifics but it goes along the lines of how the petals and leaves bloom at different times, fated to be of one body but destined never to ever meet. So i am pretty sure that Yuan Qing Suo will die. It is sad but nice to know that the production team does not back down from taking responsibility for the cut scene and is truthful to the fans. Last edited by charbydis; 10-20-16 at 09:39 AM.